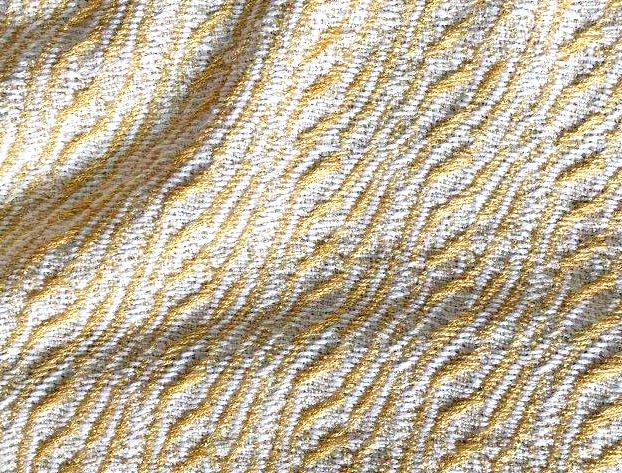 I read Verda Elliott’s interesting article, “Woven Moiré: a Fabric that is About a Fabric,” when it was first published in Weaver’s magazine issue #20 in 1993. I have been curious about woven moiré ever since I read this article, and I finally decided to give it a try. Sadly, Verda passed away in 2009 but her inspiring work lives on. In this article, Verda describes how one of the ways commercial moiré fabrics are made is by physically pressing a moiré pattern into the face of the fabric with rollers that have a moiré pattern engraved on them using pressure and heat. But Verda wanted to achieve a moiré effect in a woven structure so she used a divided draft, superposing two twills. I think she used the word “superpose” rather than “superimpose” because it’s a more scientific term. 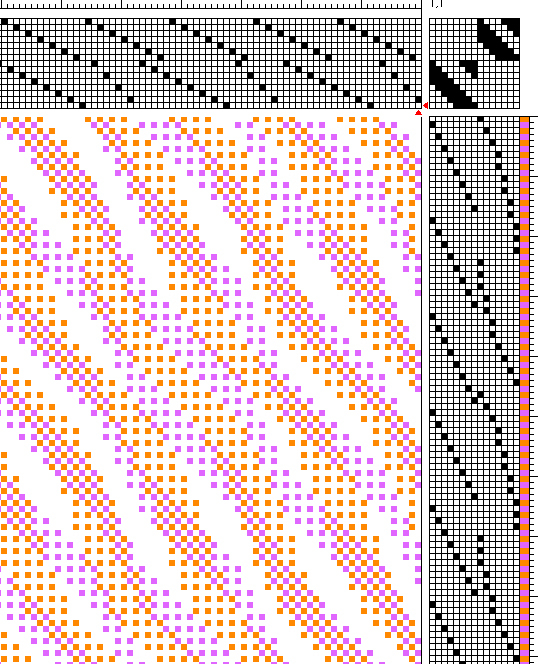 I followed Verda’s instructions and wove a few moiré samples using her drafts from the article and then designed my own drafts and wove some more samples. In this post I’ll be sharing my moiré experience with photos, drafts and notes. One of Verda’s drafts is for a moiré evening bag that I used to weave Sample #1 below. The photo shows the mostly weft-faced front and the mostly warp-faced back. Verda’s draft has a straight and an undulating twill threaded alternately – one twill on odd warp ends and the other one on even warp ends, and it has alternate treadling as well. 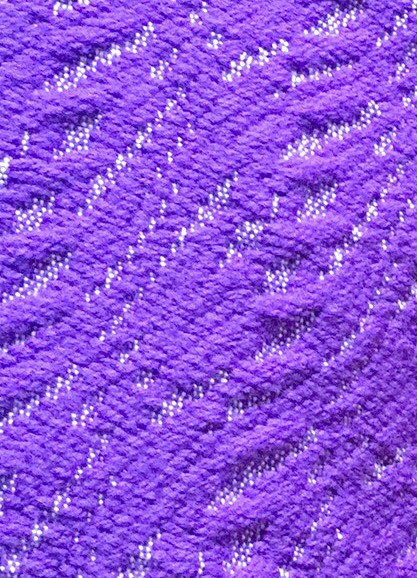 To weave the fabric for her evening bag she used shiny rayon yarns that work really well for creating a moiré effect. 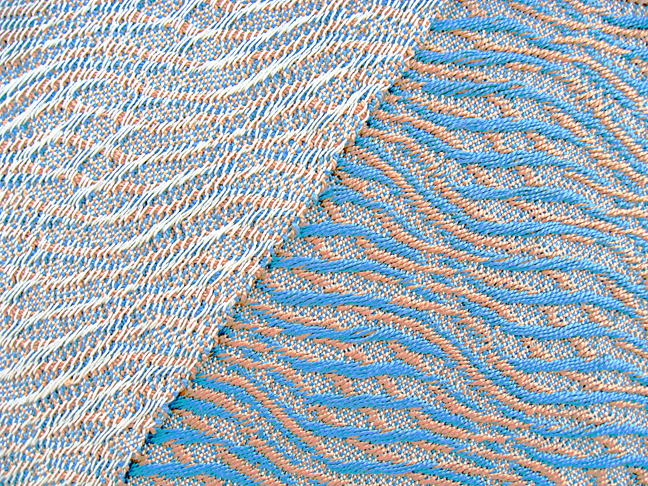 I used yarns that are not as shiny as rayon – white 10/2 pearl cotton for the warp at 28 epi and blue and tan 5/2 pearl cotton for the weft. The finished cloth is fairly stable and somewhat thick with areas of very long floats among areas of firm plain weave. Sample #2 below is my own design. 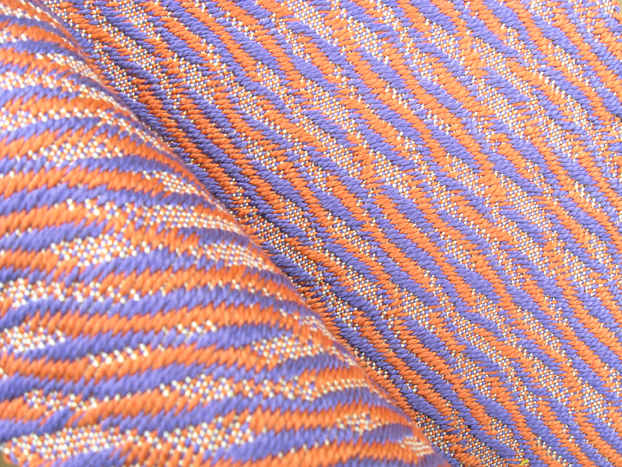 This time I used white 20/2 rayon for the warp at 40 epi and purple and orange 5/2 pearl cotton for the weft. The floats are not as long as in Sample #1, but still long: 9 in the front and 17 in the back. But surprisingly the finished cloth is very stable. Below are different views of a partial draft for Sample #2. I like using straight and undulating twills, but Verda notes that you can also use other types of twills like point twills. In this draft each twill uses its own threading, treadling, and tie-up with a total number of 15 shafts and 15 treadles. Verda recommends an odd number of shafts because it produces a better moiré effect. Most moiré drafts are very long and this draft is also too long to post a full repeat of it here. I thought of using Fiberworks’ “interleave” feature to generate the draft, but it doesn’t seem to work with an odd number of shafts and treadles. So I did it manually with the help of the “copy” and “paste” features. If you have weaving software and would like the WIF file for the complete draft let me know. Next are two samples I wove from another one of Verda’s drafts. Samples #3A and 3B are front and back of the same sample using alternating black and white 20/2 cotton for the warp, and alternating purple and tan 20/2 cotton for the weft. The sett is 40 epi. In this sample, I think the mostly weft-faced front and the mostly warp-faced back are both interesting. Sample #4 below uses the same threading as Sample #3A/B but the 20/2 cotton warp is all white, the 20/2 cotton weft is all black, and the sett is closer at 54 epi. 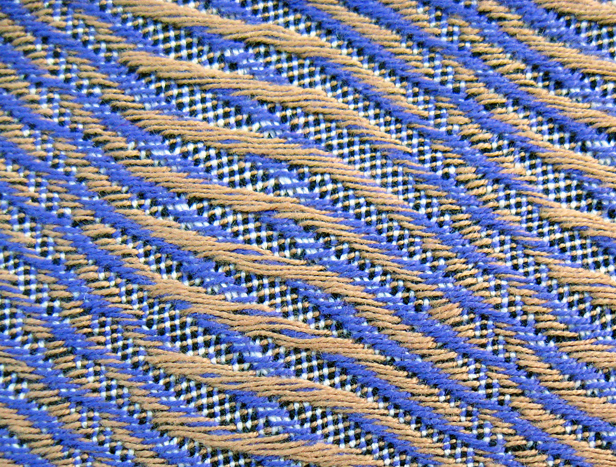 There is something very different about this sample – both twills are woven simultaneously by using 2 treadles at the same time rather than alternate treadling. 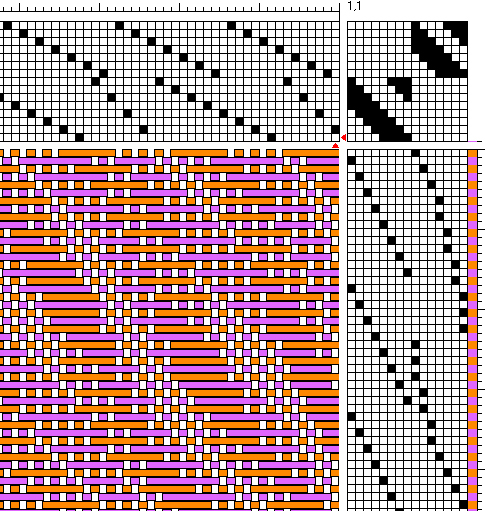 The photo shows only one side, but both front and back are mostly warp-faced and look similar. That’s it for moiré! See you next time! UPDATE June 6, 2018: Marilize van der Merwe sent me photos of her beautiful woven moiré work that she is kindly willing to share with everyone. Below are a few of the photos, thank you Marilize! 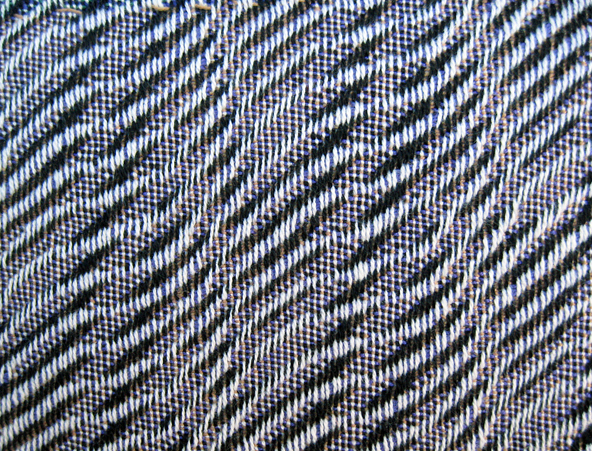 This entry was posted on May 29, 2018 at 3:16 pm and is filed under Twill, woven moiré. You can subscribe via RSS 2.0 feed to this post's comments. Thank you, Eva! An inspiring post, as always! Denise, thank you so much for your comment! Yes, I would love to get the WIF files for the Moire weaving. Rescuing one animal may not change the world, but for that one animal, the world will be changed forever. I’m happy to send you the wif file. Thanks for your interest. Hi Olivia, I will send you the wif file for Sample #2 which is my design that I’m happy to share. The drafts for the other samples are in Verda Elliott’s article that I describe in this blog post. This is a very interesting weave, hope you like it. Marilize, thank you so much for your comment! I was hoping someone would also appreciate this amazing weave because I haven’t seen much written about it. I played around with different threadings and treadlings and noticed that you can reduce the floats, but I think the more sweeping curves do have more floats. I will send you the wif and I would be happy if you shared some of your experiments. Lovely! & such variety of uses. Eva, I took a workshop from Verda Elliott on her woven moire. 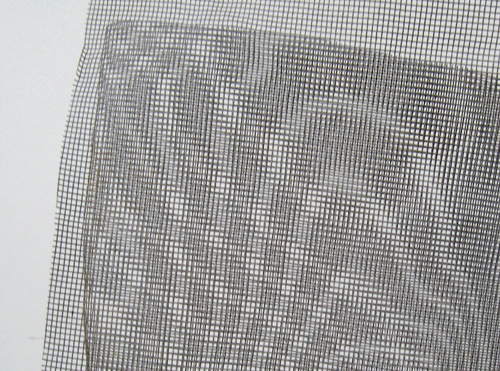 She provided clear acetate sheets that she had printed with a variety of different twill drawdowns. 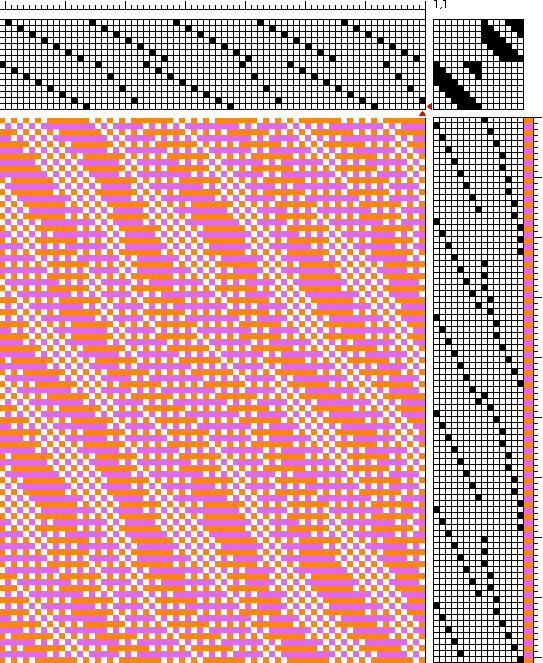 Two sheets stacked together could be pushed back and forth to create true moire patterns caused by the intersecting lines. 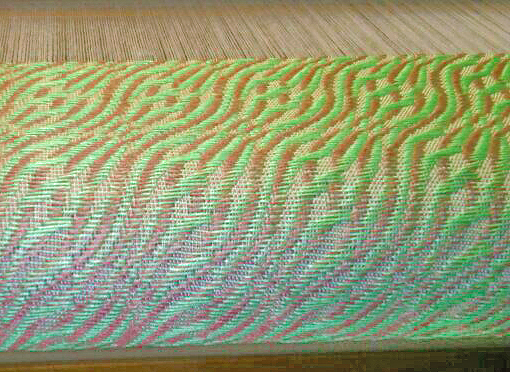 To see those patterns in the cloth, you have to choose color and value of the 2 warps and 2 wefts very carefully. I can see it in some of your pieces. Well done! 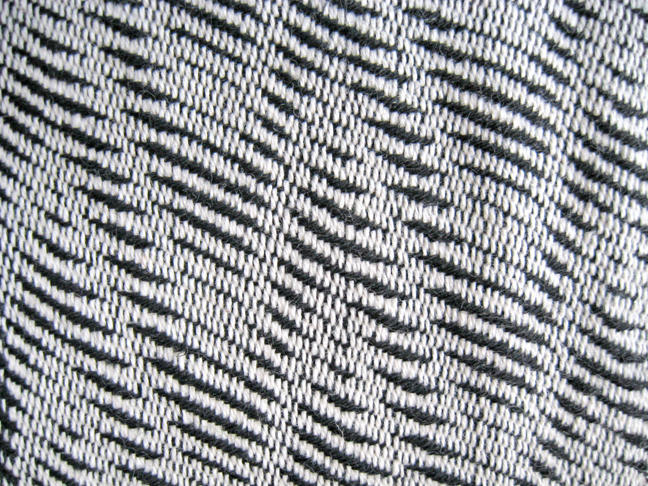 Also want to comment on commercial moire cloth- it was done by weaving a fabric with lines or ribs and then using a “calendar” which is heavy and metal and it presses a different set of lines or grid into the cloth, creating true moire designs where the lines intersect. Hi Bonnie, I’m so happy to hear from you! Thank you so much for sharing your experience with Verda and your knowledge about commercial moire cloth. It’s wonderful that you took a workshop with Verda, I wish I was there too. I also want to thank you for all your help over the years not only with your book and many articles but with your generous guidance on weaving forums and answering with patience my questions in e-mail conversations.